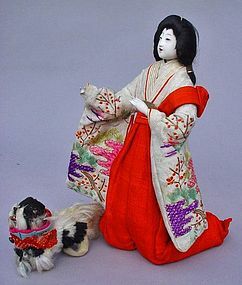 Exquisite Japanese Doll "Chinbiki Kanjo", a young court lady with a Chin dog, dated from late Meiji to Taisho period. The Chin-biki doll was a popular addition to the hina dolls from mid Meiji (1900) to 1930. Chin dogs (Japanese spaniel), have been in existence in Japan as early as 7th to 8th century. They were rare dogs and were favored by the very upper class until recent years. The Meiji Emperor had a Chin dog named “Rokugo”. This might have inspired the doll makers of Kyoto for 'Chinbiki' doll. Beautiful Kyoto Nishijin textiles. The brownish discoloration in white silk shows up a little more than shown in the photos. The red leash will be included. 11 5/6” tall, the box is 14 ½ x 9 1/8” x 7 ¾”.